In less than 12 hours, I’ll be on my way to the airport for a month-long break overseas. It’s not my first trip abroad, or course, but it is the first time since I really started embracing the sustainability path. 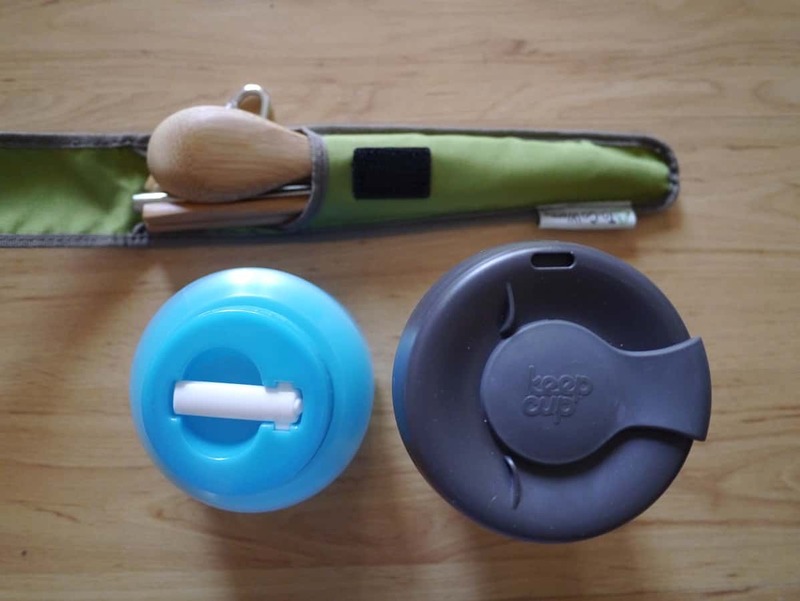 The last time I went overseas I hadn’t taken part in Plastic Free July (or given up plastic), I wasn’t passionate about reducing waste, I’d never heard of simple living and i thought minimalism was a furniture/design style. Fast forward 18 months, and all of these things have become really important to me. I don’t want my ideals to go out of the window just because I’m going on holiday, although it would be much easier to take a break from all of that too. I have decided to pack as lightly as I can. Having been on numerous trips where I’ve taken far too much and cussed as I’ve had to haul heavy luggage all about the place, this is something I’ve been working on for years. 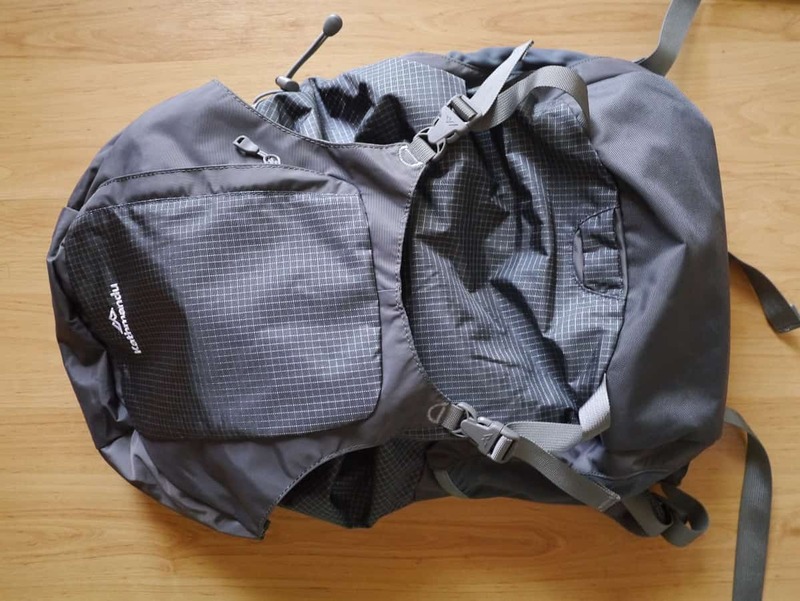 I read Leo Babauta’s post about travelling around Europe for three weeks with a 15L backpack, and I was inspired to make my luggage as light as possible. Let’s be clear, I am female, and there was no way I could manage with as little as he took, but my goal is to fit my luggage for the trip into a hand luggage bag. Thing is, I didn’t have a hand luggage backpack, and, having left it until the last minute, I actually purchased a new bag because it was considerably cheaper and smaller than any of the bags that were available second-hand. I’m not super pleased about having to buy a new one, but at least it’s sturdy and well made so should last for a long time. Clothes packing was super easy. I figure that I’ll need to do laundry whilst I’m away, so why not accept it and take less rather than try to carry as many clean outfits as possible? 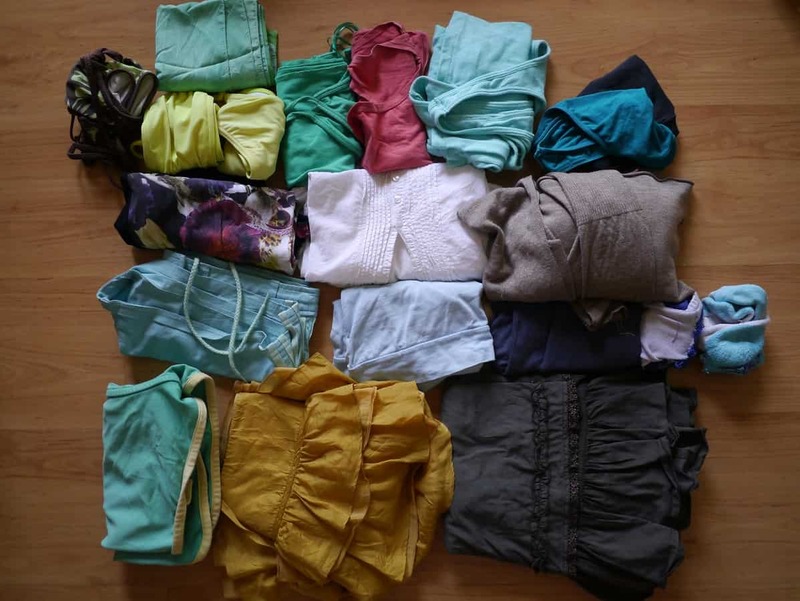 I’ll probably wear the same three things all holiday, so why pack more? There is a risk that it will be colder or wetter than expected, and I’ll need to buy something else whilst I’m away. Hopefully this won’t happen, but if it does then I will make sure that anything I buy is something I’ll continue to wear once I’m back. If I don’t buy cheap, disposable clothing here, then I’m not going to on holiday either. Toiletries packing was not so easy. 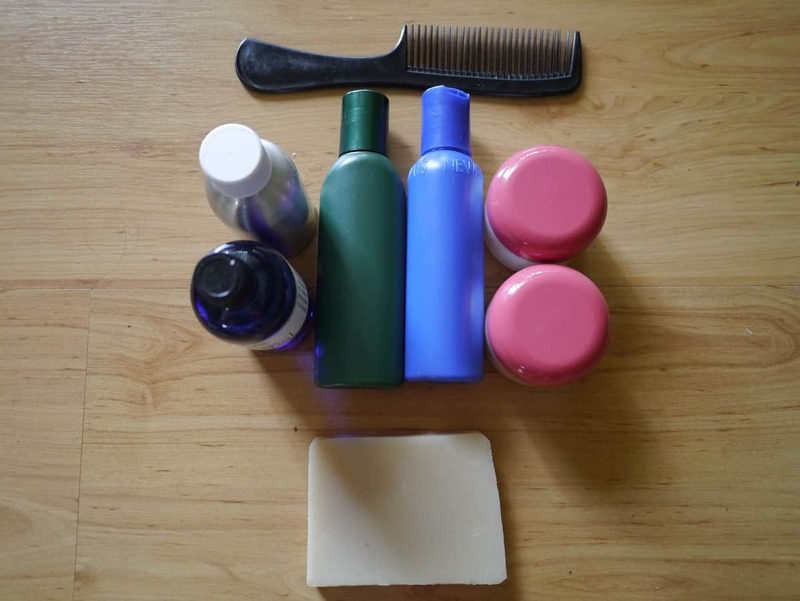 Having only purchased toiletries in glass and/or in bulk for the last year, I don’t have anything in plastic containers that I can take with me, and if I want to get my bag on the plane as hand luggage then everything needs to be 100ml or less. I’m also not sure about taking homemade cosmetics like toothpaste and deodorant through customs in unlabelled containers. The way I saw it, I have three options. One: I could not take anything and buy it all when I get there. That would save the hassle of customs but there’s no guarantee what will be available in the shops. I don’t want to end up with chemical-laden products in plastic bottles. Second: I could buy natural products in plastic containers here (so I know they are safe) in 100ml sizes and take them with me. Except, having avoided buying in plastic for so long, it seems counter-intuitive to start buying in plastic now. Plus I have everything I need at home (in bulk) so it seems extra wasteful. Third: I could decant what I have into containers (my family had spare empty plastic bottles) and hope customs don’t get too inquisitive. I’m going with option 3 – I’ve decanted what I have into small bottles that I’ve borrowed and hopefully they won’t get confiscated. I did have to make a purchased plastic exception – some suncream. My luggage is still pretty small and light, but this is where I’m going to deviate from the minimalist ideal. Because whilst I fully embrace the idea of having less, I can’t embrace the idea of creating unnecessary waste. So I’ve packed a few things to try to avoid this. Firstly, I’m packing my KeepCup. Not that I’m expecting to be drinking huge amounts of takeaway cafe lattes on my trip, but I think it will be good to have an alternative to using disposable cups. In the USA, 1 million plastic cups are used on flights every 6 hours. I intend to use my cup on the plane. As its got a sealable lid, it also doubles as a Tupperware-style container. I’m also taking the disposable cutlery I received for my birthday, along with my reusable stainless steel straw that I received for taking part in Plastic Free July 2012. No plastic straws in drinks for me! The one thing I’m not really prepared for is how to avoid drinking bottled water. I toyed with the idea of buying water purification tablets, but I don’t want to be ingesting huge amounts of chemicals, and these don’t filter the water, so the sediment and gross floaty bits remain. Filters remove this but don’t kill all the nasties. There are solutions that do both but they are expensive. Do I really need this kind of equipment? I don’t want to waste money on something I use a handful of times. I’ve read that restaurants offer boiled water to drink. There are also water fountains where you pay to refill your own bottles. Fresh young coconuts can be drunk and the waste is fully biodegradable. I’m not saying that I’m not going to buy any bottled water (I’m sure there will be emergencies), but I’m going to try as hard as possible not to. And that’s pretty much it! 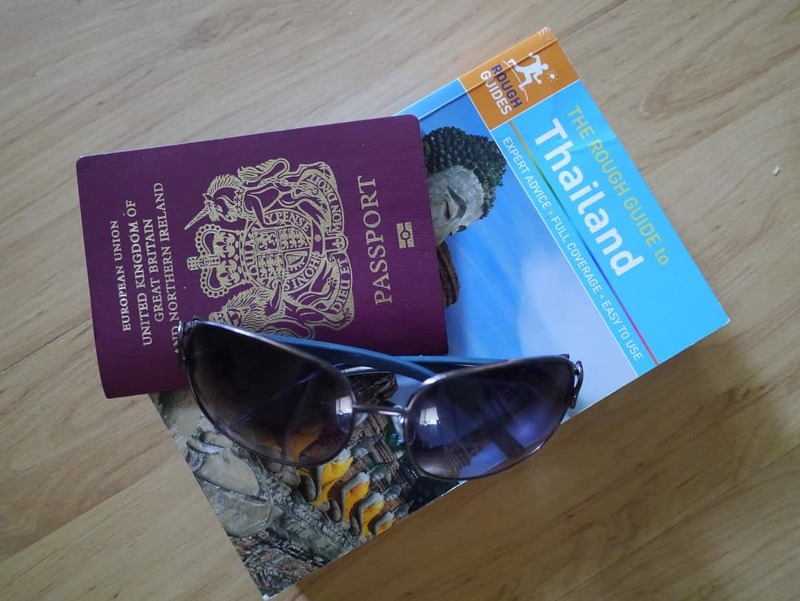 Add sunglasses, my passport, bank card and a guide book, and I think I’m set! Regarding water, at least in Thailand and Laos, and I think neighbouring countries as well, water filtration machines are commonplace in residential areas and apartment buildings. In tourist areas, they are a little harder to find, as water sales are encouraged. I also found a couple of hankies very useful. Airports in the US are installing free filtered water dispensers, for filling water bottles after going through security with them empty — very handy for taking your own water on the flight. I use refillable small containers for my 3-1-1 bag too, and have never had a problem with inspections. I’m not so good at packing light as you are though (and also tend to go to colder places so have bulkier clothes), so I love my wheeled carry-on.